Hurricane Florence devastated many families in Brunswick County. Brunswick Family Assistance is honored to partner with so many other community groups and individuals to help those impacted by this storm. FEMA Deadline 13 Dec 2018: If you were not insured, or underinsured, for the Hurricane Florence Disaster, the deadline for registering with FEMA is Dec. 13, 2018. Call FEMA at 800-621-3362 or 800-462-7585 (TTY) or go online: www.DisasterAssistance.gov. 1. Through our mobile distribution sites we provided emergency supplies (food, water, clothing, cleaning supplies, diapers, wipes, toiletries, paper products, etc.) to 13,428 individuals (over 5,000 households). THANK YOU to all of those who helped us make this possible. 2. 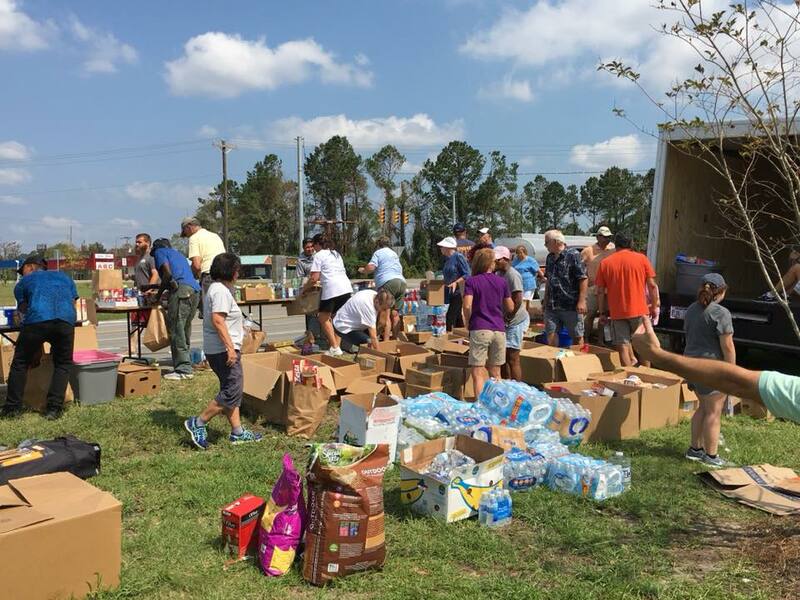 In addition to the mobile distribution sites, 3,527 individuals received emergency hurricane relief supplies/food through BFA’s two full-time food pantries. 3. BFA has provided $102,395 in financial assistance (rent, rapid-rehousing expenses, utilities, emergency shelter, medical RX, clothing vouchers and transportation assistance) on behalf of Brunswick County 960 residents affected by Florence. All of this was made possible because of the hard work and dedication of the 1,215 volunteers that worked almost 5,000 hours in the weeks following Florence. WE ARE SO GRATEFUL TO EACH AND EVERY PERSON THAT SUPPORTED THESE EFFORTS! We will continue to provide direct financial assistance through BFA’s emergency assistance programs and will be partnering with other local partners such as WARM, BHO, the Brunswick Baptist Association and others to help fund home repair and other emergency projects. Currently we are working to get contracts in place with these organizations so that these projects may begin. We estimate the contracts to be ready before the Thanksgiving Holiday and we will waste no time getting them out to our community partners. Please understand that this is marathon, not a sprint. BFA very limited staff is working as diligently as possible to meet the needs of our community and ensure that we keep open lines of communication with our community partners. While we are being VERY flexible with income guidelines for disaster relief assistance, we MUST keep accurate, detailed records of how we use any money entrusted to us. We understand how vulnerable many of our residents are during this difficult time and we want to help in any way that we can. Anyone in need of emergency supplies should contact BFA in Shallotte, NC or Leland, NC. Questions should be directed to the Brunswick Family Assistance Shallotte office at (910) 754-4766. Milestone: Monday, October 15th, 2018 – Brunswick Family Assistance would like to announce this will be the last scheduled week of mobile distribution sites for food and other supplies. As we shift our focus to long-term recovery efforts, we will continue to provide our regular services including food assistance, financial assistance, and other disaster assistance. Please call Brunswick Family Assistance Shallotte office (910) 754-4766. or Leland offices (910) 408-1700 for any questions. Volunteer: If you or your group would like to provide assistance, please contact BFA at 910-754-4766 or brunswickfamily@yahoo.com. Donating goods: If you would like to donate goods, please contact BFA at 910-754-4766 or brunswickfamily@yahoo.com to ensure that the goods being donated meet citizens’ needs. Donating financially: If you would like to contribute financially, please visit BFA’s website.